Review by AllTheBestFights.com: 2018-03-31, nice and tough fight between Kosei Tanaka and Ronnie Baldonado: it gets three stars. 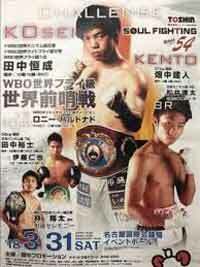 Both undefeated, the world champion in two different weight classes Kosei Tanaka entered this fight with a perfect boxing record of 10-0-0 (6 knockouts) and he is ranked as the No.3 light flyweight in the world (currently the #1 in this division is Ken Shiro) while his opponent, Ronnie Baldonado, has a record of 10-0-1 (7 knockouts) and he entered as the No.36 flyweight. Both boxers fought twice last year: Kosei won over Angel Acosta (Tanaka vs Acosta) and Palangpol CP Freshmart (Kosei Tanaka vs Palangpol CP Freshmart) while Baldonado beat Yiming Ma and Iwan Zoda. Kosei vs Baldonado is the main event of the evening. Watch the video and rate this fight!